Using the Metrics Dashboard, you can collect and view model metrics to get an assessment of your project quality status. For more information, see Collect and Explore Metric Data by Using the Metrics Dashboard. You can use the model metric API to run the model metrics programmatically and export the results to a file. For more information, see Collect Model Metrics Programmatically. For your company guidelines and standards, you can also use the model metric API to create your own model metrics, compute those metrics, and export the metric data. For more information, see Create a Custom Model Metric. To collect metric data on a model or subsystem, run these metrics. Calculates the number of blocks in the model. Calculates the number of subsystems in the model. Calculates the number of library-linked blocks in the model. Calculates the number of effective lines of MATLAB® code. Calculates the number of Stateflow® objects. Calculates the subsystem depth of the model. Calculates the number of inports and outports in your model. File metric Calculates the number of model and library files. Matlab Function metric Calculates the number of Matlab Function blocks in your model. Model file count Calculates the number of model files. Parameter metric Calculates the number of data objects that parameterize the behavior of a model. Stateflow chart metric Calculates the number of Stateflow charts in your model. For more information on model metrics, see Collect Model Metrics. To learn more about the architecture for a model or subsystem, run these metrics. Calculates the cyclomatic complexity of the model. Clone content metric Calculates the fraction of total number of subcomponents that are clones. Clone detection metric Calculates the number of clones in components across the model hierarchy. Library content metric Calculates the fraction of total number of components that are linked library blocks. To determine if your model or subsystem is compliant with standards and guidelines, run one or more of these metrics. Determines warnings for MATLAB code blocks in your model. Calculates the number of diagnostic warnings reported. Returns the fraction of checks the model passes from Model Advisor DO-178C/DO-331 Standards. Returns the fraction of checks the model passes from Model Advisor MAAB Standard. Reports the number of issues from Model Advisor DO-178C/DO-331 Standards. Reports the number of issues from Model Advisor MAAB Standard. Run these metrics to determine readability for a model or subsystem. Determines nondescriptive Inport, Outport, and Subsystem block names. Calculates the data and structure layer separation. Using the Model Advisor, run the check, Simulink block metric in By Task > Model Metrics > Count Metrics. Programmatically, use slmetric.Engine.getMetrics with the metric identifier, mathworks.metrics.SimulinkBlockCount. AggregatedValue: Number of blocks for component and its subcomponents. Does not include any underlying blocks used to implement a MathWorks block that you used from the Simulink Library Browser. Does not include links into MathWorks libraries, which means that MathWorks library blocks that are masked subsystems are counted as one block. The inner content of those blocks is not counted. Does not include hidden content under Stateflow Charts or MATLAB Function blocks. Does not include requirements blocks. Analyzes content in masked subsystems. If specified, analyzes the content of library-linked blocks or referenced models. Use this metric to calculate the number of subsystems in the model. The results provide the number of subsystems at the model and subsystem level. Using the Model Advisor, run the check, Subsystem metric in By Task > Model Metrics > Count Metrics. Programmatically, use slmetric.Engine.getMetrics with the metric identifier, mathworks.metrics.SubSystemCount. AggregatedValue: Number of subsystems for a component and its subcomponent. Does not count subsystems linked to MathWorks® libraries. Use this metric to calculate the number of library-linked blocks in the model. The results provide the number of library-linked blocks at the model and subsystem level. Using the Model Advisor, run the check, Library link metric in By Task > Model Metrics > Count Metrics. Programmatically, use slmetric.Engine.getMetrics with the metric identifier, mathworks.metrics.LibraryLinkCount. Value: Number of library linked blocks. AggregatedValue: Number of library linked blocks for a component and its subcomponents. Does not count subsystems linked to MathWorks libraries. Run this metric to calculate the number of effective lines of MATLAB code. Effective lines of MATLAB code are lines of executable code. Empty lines, lines that contain only comments, and lines that contain only an end statement are not considered effective lines of code. The results provide the number of effective lines of MATLAB code for each MATLAB Function block and for MATLAB functions in Stateflow charts. Using the Model Advisor, run the check, Effective lines of MATLAB code metric in By Task > Model Metrics > Count Metrics. Programmatically, use slmetric.Engine.getMetrics with the metric identifier, mathworks.metrics.MatlabLOCCount. Value: Number of effective lines of MATLAB code. AggregatedValue: Number of effective lines of MATLAB code for a component and its subcomponents. Does not analyze the content of MATLAB code in external files. Using the Model Advisor, run the check, Stateflow chart objects metric in By Task > Model Metrics > Count Metrics. Programmatically, use slmetric.Engine.getMetrics with the metric identifier, mathworks.metrics.StateflowChartObjectCount. Value: Number of Stateflow objects. AggregatedValue: Number of Stateflow objects for a component and its subcomponents. Using the Model Advisor, run the check, Lines of code for Stateflow blocks metric in By Task > Model Metrics > Count Metrics. Programmatically, use slmetric.Engine.getMetrics with the metric identifier, mathworks.metrics.StateflowLOCCount. Value: Number of Stateflow block code lines. AggregatedValue: Number of Stateflow block code lines for a component and its subcomponents. Measures: Vector with two entries: number of effective lines of code in MATLAB action language and number of effective lines of code in C action language. Use this metric to count the maximum depth of all hierarchical children for a given subsystem or model starting from the given component, or root of analysis. The depth is the relative depth of the deepest branch. Depth traversal analysis stops when it reaches a referenced model or a library. Depth and level are restarted with 0 for each of these components. Using the Model Advisor, run the check, Subsystem depth metric in By Task > Model Metrics > Count Metrics. Programmatically, use slmetric.Engine.getMetrics with the metric identifier, mathworks.metrics.SubSystemDepth. Value: subsystem depth for each component in the hierarchy. Measure: level of component in the hierarchy. Inputs: Inport blocks, Trigger ports, Enable ports, chart input data and events. Outputs: Outport blocks, chart output data and events. Implicit inputs: From block, where the matching Goto block is outside of the component. Implicit outputs: Goto block, where the matching From block is outside of the component. Value: total interface size or sum of the elements of Measures. AggregatedValue: Number of inputs and outputs for a component and its subcomponents. Measures: Array consisting of number of inputs, number of outputs, number of implicit inputs, and number of implicit outputs, which are local to the component. AggregatedMeasures: Maximum number of inputs, outputs, implicit inputs, and implicit outputs for a component and subcomponents. Calculate the number of diagnostic warnings reported during a model update for simulation. 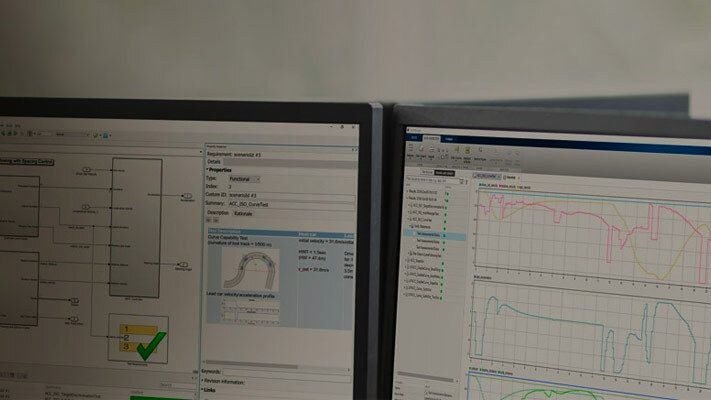 Use this metric to calculate the number of Simulink diagnostic warnings reported during a model update for simulation. This metric is available with Simulink Check. To collect data for this metric, use slmetric.Engine.getMetrics with the metric identifier, mathworks.metrics.DiagnosticWarningsCount. Value: Number of diagnostic warnings reported. AggregatedValue: Number of diagnostic warnings reported for component and its subcomponents. Display number of inputs and outputs in the model, excluding From and Goto blocks. This metric is available with Simulink Check. To collect data for this metric, use slmetric.Engine.getMetrics with the metric identifier, mathworks.metrics.ExplicitIOCount. Measures: Array consisting of number of inputs and number of outputs which are local to the component. AggregatedMeasures: Maximum number of inputs and outputs for a component and subcomponents. Excludes From and Goto blocks. Calculates the number of model and library files used by a specific component and its subcomponents. Use this metric to count the number of model and library files used by a specific component and its subcomponents. This metric is available with Simulink Check. To collect data for this metric, use slmetric.Engine.getMetrics with the metric identifier, mathworks.metrics.FileCount. Value: Number of model and library files. Calculates the number of Matlab Function blocks inside a component. Use this metric to count the number of Matlab Function blocks inside a component. This metric is available with Simulink Check. To collect data for this metric, use slmetric.Engine.getMetrics with the metric identifier, mathworks.metrics.MatlabFunctionCount. Value: Number of Matlab Function blocks. AggregatedValue: Number of Matlab Function blocks for component and its subcomponents. Calculate the number of model files. Use this metric to count the number of model files. This metric is available with Simulink Check. To collect data for this metric, use slmetric.Engine.getMetrics with the metric identifier, mathworks.metrics.ModelFileCount. Value: Number of files reference by a component and its subcomponents. Calculate the number of parameters. Use this metric to calculate the amount of user-managed parameterization data inside a Simulink system. A parameter is a variable used by a Simulink block or object of a basic type (single, double, uint8, uint16, uint32, int8, int16, int32, boolean, logical, struct, char, cell), Simulink.Parameter, Simulink.Variant, or enum value. The parameter can be stored in either the base workspace, the model workspace, or a data dictionary. This metric is available with Simulink Check. To collect data for this metric, use slmetric.Engine.getMetrics with the metric identifier, mathworks.metrics.ParameterCount. Value: Number of parameters used inside a component. AggregatedValue: Number of parameters for a component and its subcomponents. Uses the Simulink.findVars function and inherits the limitations of this function. Counts the parameter instances in a component rather than unique parameters. Does not include parameters in masked workspaces. Does not include data type and signal objects. Calculate the number of Stateflow charts at any component level. Use this metric to count the number of Stateflow charts at any component level. This metric is available with Simulink Check. To collect data for this metric, use slmetric.Engine.getMetrics with the metric identifier, mathworks.metrics.StateflowChartCount. Value: Number of Stateflow charts at the model level. AggregatedValue: Number of charts for component and its subcomponents. N is the number of decision points that the object represents and on is the number of outcomes for the nth decision point. The tool adds 1 to the complexity number for atomic subsystems and Stateflow charts. Using the Model Advisor, run the check, Cyclomatic complexity metric in By Task > Model Metrics > Complexity Metrics. Programmatically, use slmetric.Engine.getMetrics with the metric identifier, mathworks.metrics.CyclomaticComplexity. Does not run on library models. Does not analyze inactive variants. Does not analyze referenced models in accelerated mode. Calculates the fraction of total number of subcomponents that are clones. Use this metric to calculate the fraction of the total number of subcomponents that are clones. Clones must have identical block types and connections but they can have different parameter values. For more information on clone detection, see Enable Component Reuse by Using Clone Detection. This metric is available with Simulink Check. To collect data for this metric, use slmetric.Engine.getMetrics with the metric identifier, mathworks.metrics.CloneContent. Measures: Vector containing number of clones, total number of components, and clone group number. Calculate the number of clones in a model. Use this metric to count the number of clones in a model. Clones must have identical block types and connections but they can have different parameter values. This metric is available with Simulink Check. To collect data for this metric, use slmetric.Engine.getMetrics with the metric identifier, mathworks.metrics.CloneDetection. AggregatedValue: Number of clones for component and its subcomponents. Calculates the fraction of total number of components that are linked library blocks. Use this metric to calculate the fraction of total number of components that are linked library blocks. This metric is available with Simulink Check. To collect data for this metric, use slmetric.Engine.getMetrics with the metric identifier, mathworks.metrics.LibraryContent. Value: Fraction of the total number of subcomponents that are linked library blocks. Run this metric to determine nondescriptive Inport, Outport, and Subsystem block names. Default names appended with an integer are nondescriptive block names. The results provide the nondescriptive block names at the model and subsystem levels. Using the Model Advisor, run the check, Nondescriptive block name metric in By Task > Model Metrics > Readability Metrics. Programmatically, use slmetric.Engine.getMetrics with the metric identifier, mathworks.metrics.DescriptiveBlockNames. Value: Number of nondescriptive Inport, Outport, and Subsystem block names. AggregatedValue: Number of nondescriptive Inport, Outport, and Subsystem block names for a component and its subcomponents. Run this metric to calculate the data and structure layer separation. The results provide the separation at the model and subsystem level. Run this metric to calculate the data and structure layer separation. The results provide the separation at the model and subsystem levels. Using the Model Advisor, run the check, Data and structure layer separation metric in By Task > Model Metrics > Readability Metrics. Programmatically, use slmetric.Engine.getMetrics with the metric identifier, mathworks.metrics.LayerSeparation. For guidelines about blocks on model levels, see the MAAB 3.0 guideline db_0143: Similar block types on the model levels. Value: Number of basic blocks on a structural level. AggregatedValue: Number of basic blocks on a structural level for a component and its subcomponents. Use this metric to calculate the number of MATLAB code analyzer warnings from MATLAB code in the model. This metric is available with Simulink Check. AggregatedValue: Number of MATLAB code analyzer warnings aggregated for a component and subcomponents. Use this metric to calculate the fraction of Model Advisor checks that pass for the High-Integrity Systems subgroups. This metric is available with Simulink Check. Value: Fraction of total number of checks passed in High-Integrity Systems subgroups. AggregatedValue: Fraction of total number of checks passed in High-Integrity Systems subgroups aggregated for a component and all of its subcomponents. Measures: Vector containing: number of checks passed in subgroups and number of checks in subgroups. AggregatedMeasures: Vector containing: number of checks passed in subgroups and number of checks in subgroup, for a component and all its subcomponents. A value of 0 indicates that a check did not run. A value of 1 indicates that a check passed. A value of 2 indicates a check warning. A value of 3 indicates a failure. Analyzes content in Stateflow objects. Use this metric to calculate the fraction of Model Advisor checks that pass for the group Modeling Standards for MAAB. This metric is available with Simulink Check. Value: Fraction of total number of checks passed in MAAB. AggregatedValue: Fraction of total number of checks passed in MAAB aggregated for a component and all of its subcomponents. Measures: Vector containing: number of checks passed in group and number of checks in group. AggregatedMeasures: Vector containing: number of checks passed in group and number of checks in group, for a component and all its subcomponents. Use this metric to calculate number of issues reported by the subgroups of Model Advisor checks for High-Integrity Systems. An issue is a Simulink object that the Model Advisor check flags. You see an issue in the check output as a hyperlink and in the Simulink Editor with Model Advisor highlighting. For configuration parameter checks, we add one issue to each model component that fails the check. This metric is available with Simulink Check. AggregatedValue: Number of issues reported by the High-Integrity Systems checks aggregated for a component and all of its subcomponents. Use this metric to calculate number of issues reported by the group of Model Advisor checks for Modeling Standards for MAAB. An issue is a Simulink object that is flagged by the Model Advisor check. You see an issue in the check output as a hyperlink and in the Simulink Editor with Model Advisor highlighting. This metric is available with Simulink Check. Value: Number of issues reported by the Model Advisor for MAAB checks. AggregatedValue: Number of issues reported by the Model Advisor for MAAB checks aggregated for a component and all of its subcomponents. Adds check issues on the configuration set or issues with data objects to the issue count at the model root level.